One of the reasons why South Africa is such a good place for star-gazers, is that here you can see the Southern Cross, Triangulum Australe (the Southern Triangle), Centaurus and several other constellations which are not visible in the Northern Hemisphere. The night skies are especially clear during winter, which is a good time to visit South Africa if you’re a star-gazer. Ulusaba Private Game Reserve has an observatory in the bush for star gazers. Combine some star-gazing with a premier Big Five safari at Ulusaba Private Game Reserve in the Sabi Sand. This top-of-the-range safari lodge has its own observatory, where you can appreciate Africa’s magnificent night skies with rangers who have been trained in star gazing. You’ll also have a very rewarding safari, with twice daily drives into the wilderness, and lots to do in between. At the spectacular De Hoop Nature Reserve in the Western Cape, you can go on a 1-hour star-gazing and star identification excursion, during which you’ll experience the stars and constellations of the remarkably clear De Hoop night sky. You’ll also enjoy nature in all her glory at this beautiful reserve. 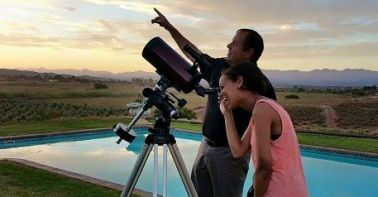 The clear skies of the Cederberg are ideal for star gazing. Gorgeous Bushmans Kloof is one option. 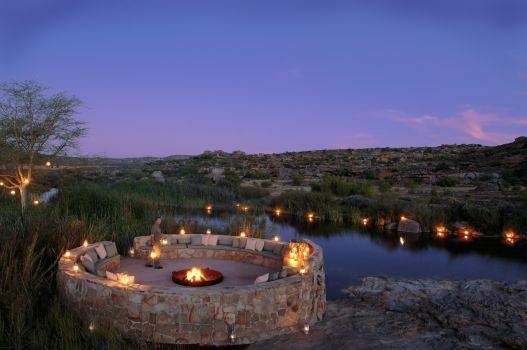 The Cederberg – a rugged rocky area 270km away from Cape Town – is another wonderful place for star-viewing. 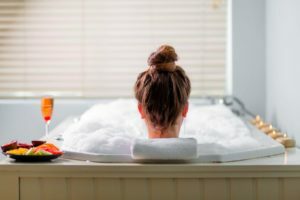 Visit Bushmans Kloof Wilderness Reserve and Retreat and if you can, attend one of their periodic star-gazing events led by an expert in the field. This is also a fantastic place for viewing ancient rock art. Kagga Kamma in the Cederberg has a mini observatory where an expert facilitates an incredible star gazing experience during which you can sight the stars, the moon and the planets through a powerful telescope. Thanda Private Game Reserve in KwaZulu-Natal includes star-gazing in its many activities, which also include exciting Big Five safaris, deep-sea fishing trips, hippo and croc safaris, and diving exursions. The Waterberg in Limpopo Province offers fantastic star-watching due to its clear skies and low levels of light pollution. An ultra-luxurious Waterberg experience is offered at Leoba Private Reserve. The award-winning Observatory Bush Villa is an exquisite two-bedroomed bush sanctuary for small groups, and is made available on an exclusive-use basis. Safari drives are not timetabled, but are available as and when guests choose them – by day and by night. 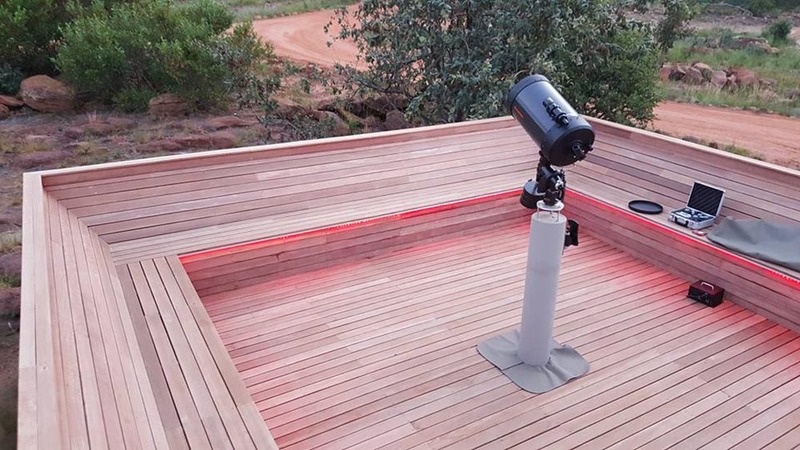 Stand by for stargazing in a dome housing sophisticated telescopes that provide views of the moon, planets, other celestial objects and the sun. Marvel at the constellations of the African sky on the star deck at Mhondoro Game Lodge in the Welgevonden Reserve. On a clear night you could see about 2500 stars on the comfy star deck with custom seating designed to enable stargazing. 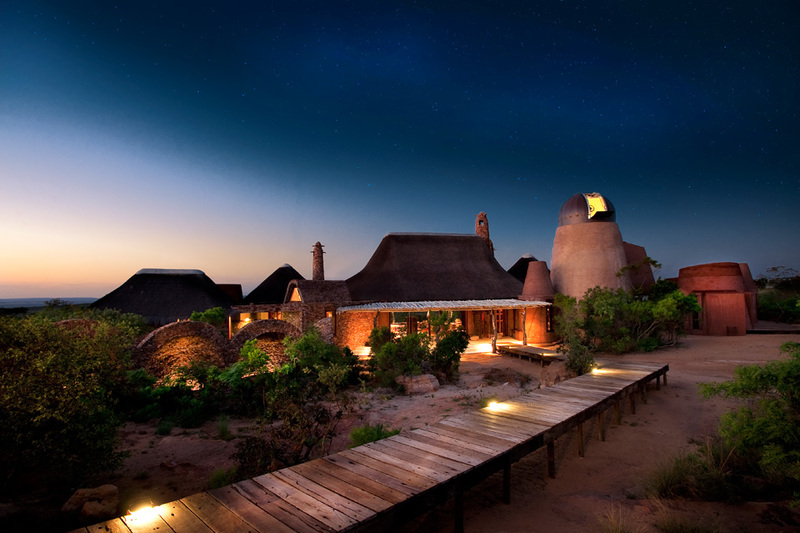 The 22 000 hectare Entabeni Private Game Reserve has an observatory for night-sky viewing. This reserve is well-known for its unique wilderness golf experience – with its Extreme 19th played from atop a mountain and accessible only by helicopter! The wide open plains of the Karoo and Klein Karoo were made for stargazing. Guided night tours are available in the area. Marvel at the Klein Karoo’s night skies at De Denne Country Guest House in the Oudtshoorn Area. 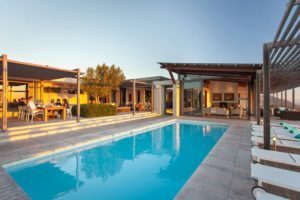 De Denne Country Guest House is a four-star country hideaway set on a working ostrich farm just outside Oudtshoorn in the Klein Karoo and looking out across the farmlands of the Olifants River valley and the Swartberg Mountains. After dinner on a cloudless night, your guide will introduce you to the spectacular night skies of this region. Sutherland in the Northern Cape is probably the most celebrated of all star-viewing locations in South Africa. It’s the site of the South African Large Telescope (SALT) – and this is the place of all places to go stargazing in South Africa. Sutherland is known for a big five of a different nature – the Celestial Big Five! It gets extremely cold there, so be sure to take your warmest woolies. More about star-gazing in Sutherland. The Johannesburg Planetarium, situated on the campus of the University of the Witwatersrand, was the first of its kind in Africa, and only the second planetarium ever built in the Southern Hemisphere. 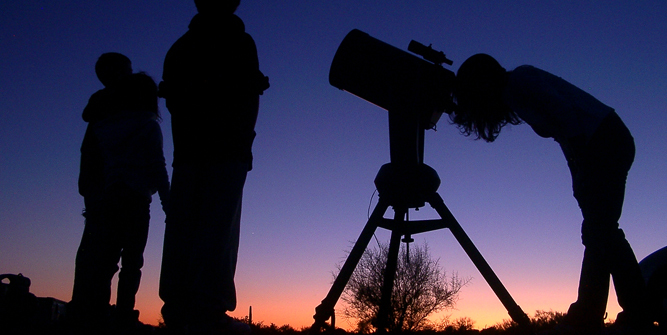 It is open to the public on most evenings, hosting shows such as the ‘In the Sky Tonight’ series, as well as children’s star parties and astronomy courses. Mail us, or call our Getaway Consultants on 0860 102 907 (local) or +27 21 797-7122 (international).